1. Clean the area to be joined of patina, coatings, oils, etc. Clean metal will solder quickly and easily. 2. 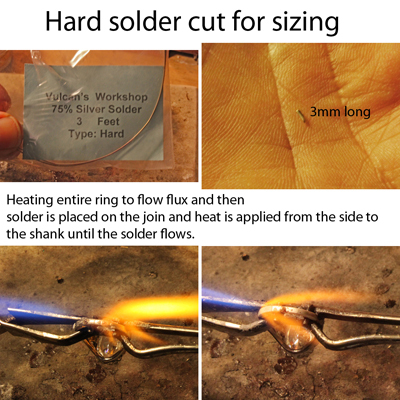 Use flux to help the solder stick. 3. Use a big enough flame and the right part of the flame for the job. 4. Pick the right type of solder for the situation. 5. Don't overheat the join. 6. 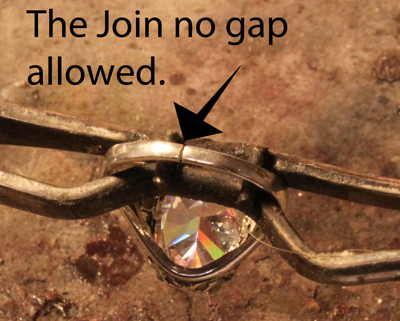 Make sure the metals touch…solder does not fill gaps. 7. Use an anti-scale compound to save time after soldering. There are many more but these will get you started. Remember, this is both a mental and physical task that gets easier the more you do it. Practice. Expect to make mistakes and keep at it. Some basic tools are required. First the torch…it can be anything affordable and comfortable to work with. I use butane fueled torches. 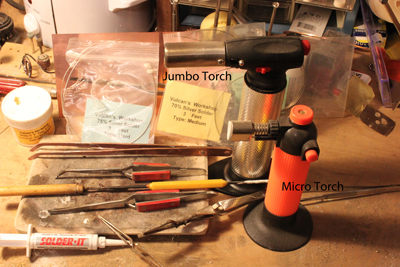 Mostly the jumbo torch because it has the heat to solder larger pieces and doesn't need refilled constantly. A small kitchen torch is okay for jump rings or light weight wire but won't be able to heat a large area or thick metal. The best torch I have found is called the Jumbo Max Flame Butane torch. It uses the same fuel as the small butane torch but can heat up a filigree or solder a ring very easily and fits in the hand and carries more fuel. They are available from www.wiredupbeads.com Propane, mapp gas and combination torches with oxygen are all available. The advantage of adding oxygen is heat and speed. But they are more costly and not needed for the type work we are most often doing. Consider one of those if you are going to cast metal or do a lot of forging. 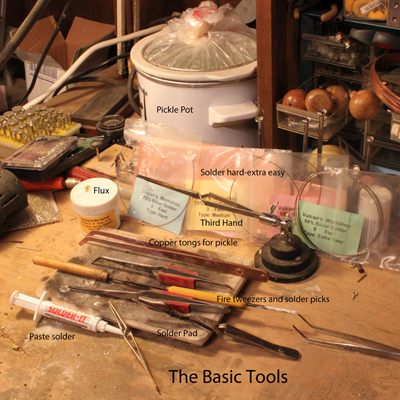 In addition to this a soldering pad to protect work surfaces, hard charcoal block, some solder picks, fire tweezers with wood handles to insulate so you don't burn your fingers, pickle and pot to remove flux and firescale, and of course the solder itself. Additionally a third hand(jointed tweezer on a base) is very handy. Solder comes in grades labeled for the melting temperature and silver content. Soft solder is very low in silver and flows at 300-400 degrees. The need for different flow temp solders comes into play when you have to attach several components…if you used just one the parts would all melt at the same time and that isn't always useful. I always start with medium or hard solder and work my way down. When sizing rings hard solder is best if there are no soldered components such as plates or heads. 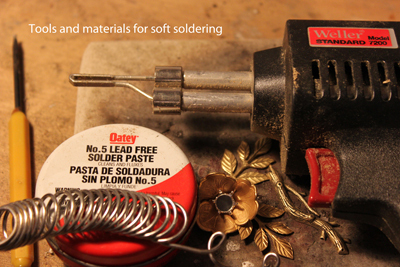 Solder can be found in wire, sheet or paste form. Flux comes in several forms. 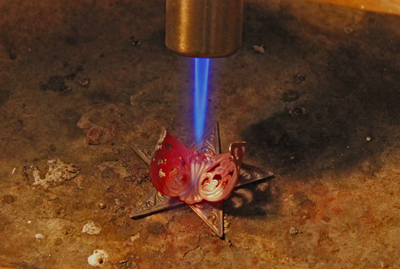 Pripps flux is one I use to reduce firescale and coat the entire metal piece with it before soldering. Boric acid dissolved in alcohol will work and other commercial products are available. Most are borax based. 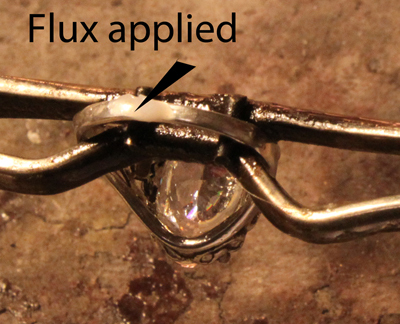 The flux will keep firescale off the metal and help the solder to flow. Too much will keep the solder from working so apply sparingly. Flux melts at about the point the solder will begin to flow so when the flux turns clear the metal is getting hot enough. I bring the solder to the join on a solder pick. It is a pointed rod in an insulating handle. Put the piece of solder on the soldering pad or charcoal and ball it up with the flame then touch the solder pick to it and remove the heat. The solder ball should stick and be carried to the join. Apply heat to the entire metal and move it about to keep all the area hot. 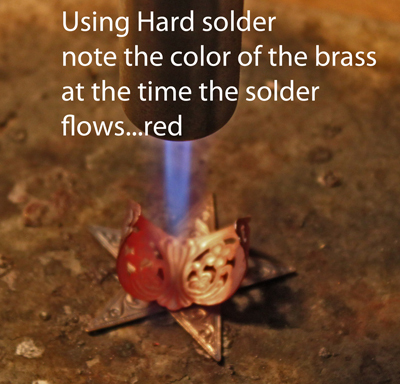 The solder will flow when everything is hot enough and when it does remove the torch and shut off the flame. At this point the metal will be too hot to touch so pick it up with the fire tweezers and quench it to cool in water. When it is cool to the touch put it into the pickle pot. I use a 1 quart electric crock pot to hold the pickle solution. It is acidic and can be used warm for a quick cleaning a few minutes if its hot and if cold up to 2 or three hours will work. It won't hurt the metal. It cleans away the flux and brightend the surface of the metal. 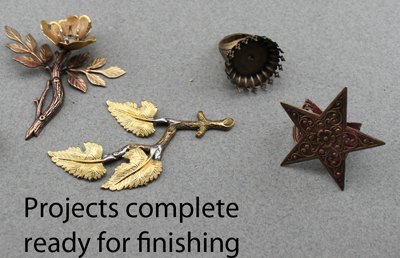 Silver will turn white , brass and bronze may become rosy or coppery in pickle. Never put steel or ferrous metals in the pickle. 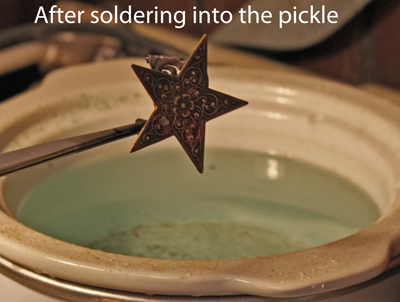 Use copper tongs to remove the object and rinse the pickle from the soldered piece. 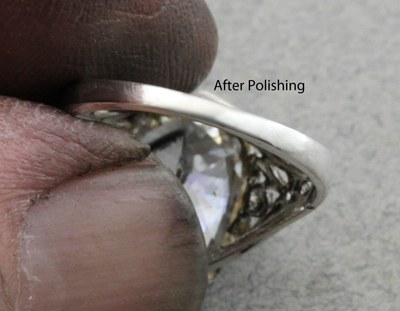 It is now ready to be polished and patina applied. 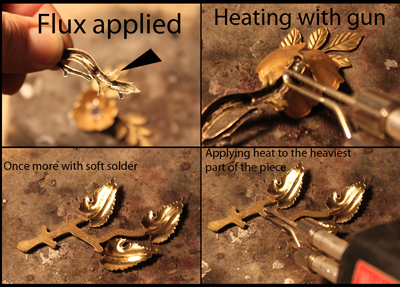 Paste soldering is a low temperature solder technique that works great with brass and especially plated items. You only have to warm the items to 400 degrees and that takes a few seconds. This is below the temperature of discoloring for most plated items. The join is prepared by putting the paste on the items and pushing them together. You can place the item in a tweezers or third hand and apply soft heat from the brushy part of the flame for a few seconds then remove the heat and wait for at least a minute before disturbing the join. No flux or pickle is needed. Quench the piece and you are ready to begin with finishing. 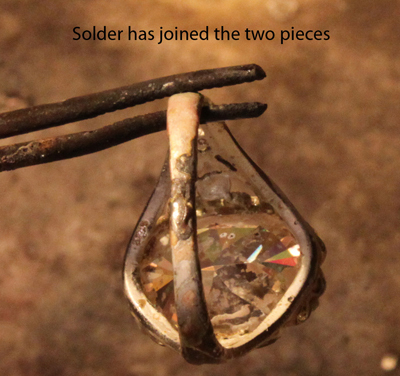 This is a great way to begin soldering and can be a confidence builder. Soft soldering is the last technique for this tutorial. It involves using solder that is primarily used for electronics and can be melted with torch or soldering tools. I find that solder irons and guns are clumsy and take a long time to heat up the metal if any amount of mass is present. Guns work best on thin plated items. 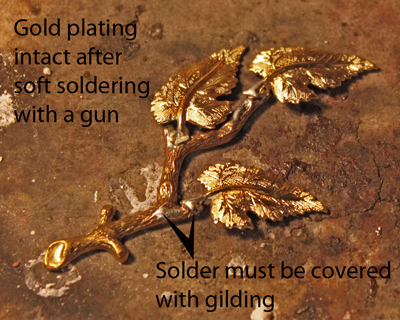 The techniques is to apply the gun to the base item hold until the flux(past form) is melted then apply a little solder from the wire roll and remove the heat after it gets shiny and is touching both parts. Don't disturb the join until the solder cools for a few seconds and the dull surface returns. This solder has a tendency to run all over and must be covered up after soldering.